Protein G (SpG) is a surface protein originally found in the cell wall of the Streptococcus sp. Protein G contains three homologous domains with binding affinity to the constant region of various sources of IgGs. The albumin binding domain as well as the cell-surface binding site of protein G was removed to eliminate the nonspecific binding. Protein G has greater affinity than protein A for most mammalian IgGs, especially human IgG3 and rat IgG2a. In addition, protein G does not bind to human IgM, IgD and IgA. Protein G can be used for many immunological applications, including detection, purification, separation and removal of host species and subclass-dependent antibodies, enzyme immobilization and purification, and detection of various biological molecules via their antibodies. Protein G Agarose, Fast Flow is prepared by covalently immobilization of recombinant SpG on 6% crosslinked agarose beads. The proprietary purification process of recombinant SpG avoids the human IgG affinity step. 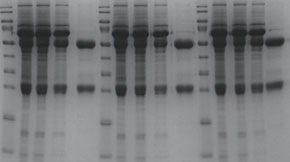 Simpson Protein G agarose resin is used for the isolation of a wide variety of immunoglobulin molecules from several mammalian species. Contact Blue Kick for product comparison data, product specifications sheet, and protein purification protocol. AccuTrap Protein A and G resin available for distribution and OEM opportunities. Bulk pricing available.